You are going to Watch Naruto Shippuden Episode 266 English subbed online free episodes with HQ / high quality. Stream Anime Naruto Shippuden Episode 266 Online English sub The First and Last Opponent. Kakashi and his division continue their fight against the Seven Ninja Swordsmen of the Mist. Suigetsu reveals to Jugo that he wants to reform his own Seven Ninja Swordsmen of the Mist and describes its former members including his brother Mangetsu with their corresponding blades they wield. 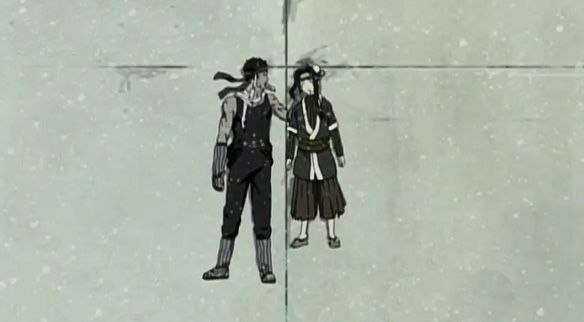 As the mist gets thicker, Kakashi strategizes with a plan to bind Zabuza. Kakashi makes his attack against Zabuza but Haku blocks the attack. Kakashi recalls Naruto on their first mission as Naruto liked Haku and Zabuza because of their unique bond. Zabuza attacks Kakashi with his Executioner’s blade and Kakashi evades even with Haku on his arm and having a sliced wound in his belly. Kakashi retaliates and successfully binds Zabuza.